The Taiwan FactCheck Center fully complies with the Code of Principles in my assessment. It has provided sufficient evidence in this application. I did communicate with them via email to clarify certain things and also made a suggestion to add more detailed biographical information about the staff (previously only titles were given), to which they responded promptly and amended the website. I do recommend the applicant to be accepted. Although the center itself was founded just a few months ago, the two founding organizations are established nonprofit organizations in Taiwan and it should not be a major concern, given that all the fact-checking articles they have published so far meet IFCN's standards. Taiwan FactCheck Center is jointly founded by Taiwan Media Watch and the Association for Quality Journalism. It is organized for non-profit purpose. The objectives of the Center are to conduct fact checks on information relevant to public affairs as well as to improve the information ecology and news quality of Taiwan. The Center’s founding purpose and Charter are clearly posted on the Center’s official website. 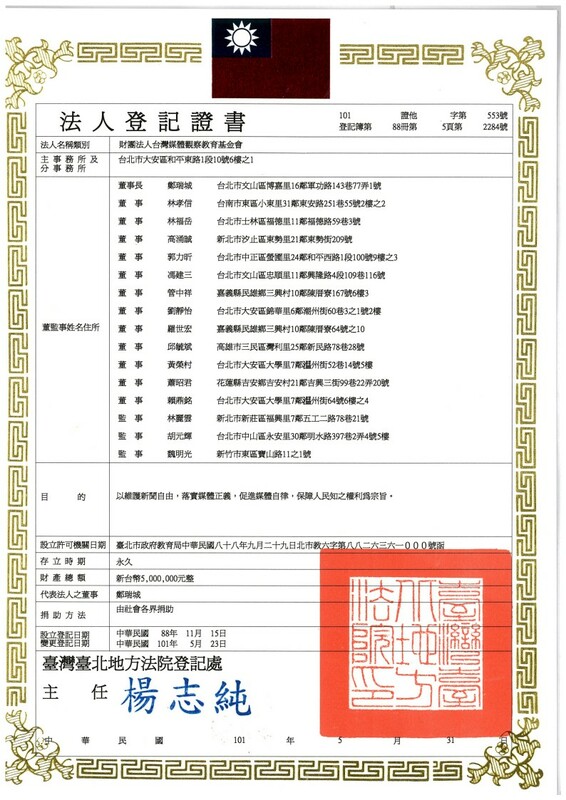 Please refer to the attached English translation of the Charter of the Taiwan FactCheck Center and the registration certificates of the two parent organizations. 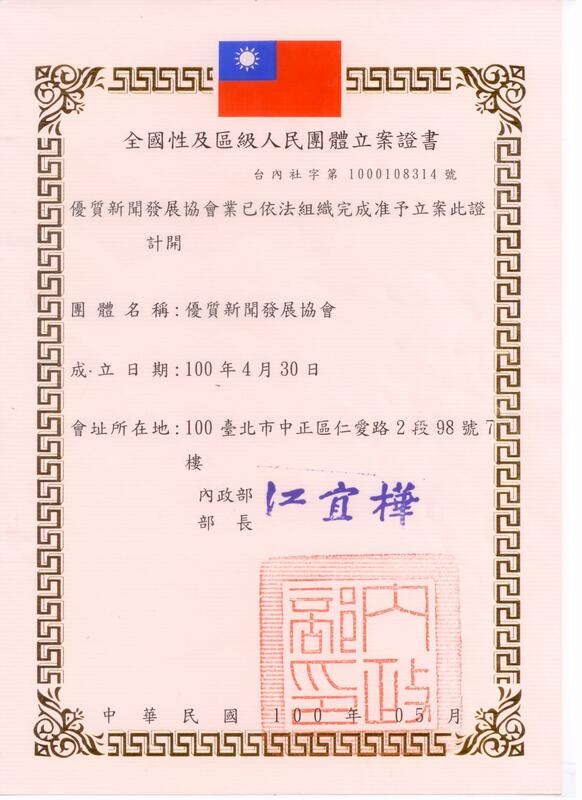 Although the applicant itself is not a registered entity per se but a project, the two registered organizations that founded the Taiwan FactCheck Center meet all the requirements. They both have a well-established history of activities in monitoring the media and supporting quality journalism in Taiwan. They have provided the necessary documents and they are fully compliant. done_all 1a marked as Fully compliant by Masato Kajimoto. I have gone through all 24 fact-checking articles they published as of October 19; all of which have met the standard in this category. done_all 1b marked as Fully compliant by Masato Kajimoto. Please refer to the attached English translation of the Taiwan FactCheck Center Operational Guidelines. Online misinformation and disinformation seem to be the main focus of the applicant at the moment (I have contacted the applicant to clarify this via email) and all articles published thus far meet the IFCN standard. There aren't many politically-charged news topics or claims except for a couple, but they show no sign of potential bias. done_all 2a marked as Fully compliant by Masato Kajimoto. Please refer to the attached English translation of the Taiwan FactCheck Center Donations Acceptance Policy. The applicant's policy is very clear and transparent. done_all 2b marked as Fully compliant by Masato Kajimoto. The Center’s fact checking operation emphasizes the principle of transparency. Each fact checked report explains its review process, and a complete list of source material, information and data used for verification is attached at the end of the report. If the information source and documents referenced in the report can be accessed online the hyperlinks are provided and the key sections are presented in screenshots. Regarding information acquired by interviewing experts and scholars, the names and titles of the interviewers are clearly listed in the main text of the report, and the films or recordings made during the interview are also provided as attachments. Item 8 of the Center's Operational Guidelines clearly stipulates: "All the information and source materials on each fact checked report are available and open for the public’s review and verification." The process of fact-checking is clearly laid out with proper links and citations. done_all 3a marked as Fully compliant by Masato Kajimoto. The Taiwan FactCheck Center Donations Acceptance Policy clearly states: "To maintain independence of operations, the Center does not accept donations from governments, political parties, and politicians." It also states "The Center exercises its editorial control independently and is not influenced by donors." In addition, all donors and their contributions are posted on the website for external access. The list of donors can be found at https://tfc-taiwan.org.tw/node/74. The Donations Acceptance Policy can be found at https://tfc-taiwan.org.tw/node/73. Please also refer to the attached English translation of the Taiwan FactCheck Center Donations Acceptance Policy. As mentioned before, Taiwan FactCheck Center is jointly founded by Taiwan Media Watch and the Association for Quality Journalism. This information is clearly disclosed in the "Organizational Structure" (https://tfc-taiwan.org.tw/about/oganization) under "About Us" in the official website. Please refer to the attached English translation of the Charter of the Taiwan FactCheck Center. Their donation acceptance policies are clearly stated as well as the list of funders they have at the moment. However, the applicant is only a few months old and there is no information about spending (naturally). done_all 4a marked as Fully compliant by Masato Kajimoto. The Center’s official website lists all members of the Center, including the members of the Executive Board, the Advisory Council, and the staff. The list of members can be found at https://tfc-taiwan.org.tw/about/oganization. The editor and two fact-checking staff's names and their relevant biographical background are listed on the site. done_all 4b marked as Fully compliant by Masato Kajimoto. The Center’s website lists various contact methods, including telephone, fax, e-mail, and Facebook. The public can send any questions and comments to the members of the Center through the contact form on our contact page. The contact page can be found at https://tfc-taiwan.org.tw/contact. Furthermore, each fact checked report has a comments section at the end of the article where registered members are free to express their comments. It is very easy for the audience to contact or leave comments. In fact, they are getting lots of requests from the users who are asking the applicant to verify some news stories. done_all 4c marked as Fully compliant by Masato Kajimoto. Taiwan FactCheck Center has set up a clear fact checking operational guidelines and posts it on the Center’s website (https://tfc-taiwan.org.tw/node/71). Please refer to the attached English translation of the Taiwan FactCheck Center Operational Guidelines. The methodology is explained very clearly on the website. done_all 5a marked as Fully compliant by Masato Kajimoto. The Center’s website includes an “Appeal Page” (https://tfc-taiwan.org.tw/appeal) where the public can raise claims about fake news or fake information. If members of the public find in their daily life a piece of information or news which may be false or misleading, they can bring the information or news to the attention of the Center through the link “I have questions” on the appeal page. If members of the public have any evidence which is helpful to verify or rebut suspected fake news or information, they can submit the information through the link “I have evidence” on the appeal page. Moreover, the person(s) or the parties who are connected to the suspected fake news or information can also provide clarified information or comments through the link "I am a party” on the appeal page. The Center values any comments and opinions from the public, and so far about 40% of the fact checked cases have been created because of public input. It does seem the applicant already has a sizable base of followers. The public can easily see what readers are sending to them. Everything looks transparent and straightforward. done_all 5b marked as Fully compliant by Masato Kajimoto. Taiwan FactCheck Center clearly lays out its correction policy which is available on the Center’s website (https://tfc-taiwan.org.tw/node/129). The policy states how the public can comment on the fact checked report, how the center deals with the public opinion internally, and how the center issues its corrections. Regarding corrections, item 9 of the Taiwan FactCheck Center Operational Guidelines clearly stipulates: "The results of the fact checking are open to external appeals and the fact checkers should process the appeals with a rigorous review. If the original fact checked report is found to contain errors the center should immediately make a correction and issue the correction to the public." To prevent fact checkers from failing to conduct fair reviews of external appeals, item 10 of the Taiwan FactCheck Center Operational Guidelines also stipulates: "Members of the Executive Board and the Advisory Council may take initiative in proposing corrections if they find the fact checked report negligent in the review process or contains errors in content. If the editor-in-chief disagrees with the external appeals, the editor-in-chief should submit a comprehensive statement to the Executive Board. The final decision shall be made by the Executive Board." Correction policy is clearly stated and the applicant provides easy ways for the public to reach out to them on their website (as well as on their Facebook page and other channels). done_all 6a marked as Fully compliant by Masato Kajimoto. So far, there have been no corrections issued from the Center. However, there have been additional materials amended to the Center’s previous fact checked reports. No correction has been made as the applicant explained. done 6b marked as Partially compliant by Masato Kajimoto.